You would have a difficult time today finding a radio station that was all-live and did not have some kind of computerized, automated means of storing and playing audio. In a bygone era, hands-on media management of records and tape cartridges ("carts") was the way of the world. Through the years, turntables, CD players and "cart decks" gave way to mechanized playback of content by banks of reel-to-reel machines under crude sequential control. The earliest fully computerized "audio on hard drive" systems for radio stations and networks ran generally under DOS, evolving into the elaborate Windows-based systems in use everywhere today. Do a web search for "Linux radio station", and the pickings are slim indeed, with most sites promoting instead ham radio software or streaming audio players, and a handful devoted to setting up a streaming web radio station—including one such optimistic article in Linux Journal some 15 years ago (see "Running a Net Radio Station with Open-Source Software", January 2001). Fortunately, the choices today are getting better. Transmitter manufacturer Nautel incorporates Linux in its AUI. Broadcast automation and media management systems, such as Airtime and DIY-DJ, were designed around Linux from the start. Many Windows-based commercial automation systems seem happy when networked with Linux servers. But, as for in-studio hands-on control of program execution, there still is a way to go. In and around the nation's capital, actual over-the-air radio programming driven by Penguin power is a reality, and you already may be listening to it wherever you are. Back around 2002, Fred Gleason, then the director of engineering for the Salem Communications radio cluster in Arlington, Virginia, saw the need for an open-source radio automation system: one that was nimble enough to handle the turn-on-a-dime demands of radio station programming, flexible enough to be modified and rewritten as the demands on it grew, and as crash-proof as possible to keep the music flowing and the commercials rolling. Working with partner and automation expert Scott Spillers, the two planted the seeds for what became the Rivendell radio automation suite. Rivendell is now under the banner of Paravel Systems, with Gleason as President and Chief Developer, and co-founder Spillers holding the VP reins. The company offers Rivendell as custom-built turnkey hardware, with a free software version as a downloadable iso file. Rivendell originally was crafted for SUSE Linux but now runs under CentOS. It is an artistic mix of custom code and popular existing libraries and applications. Gleason used the Qt Toolkit to create the user interface, allowing it to run on anything right down to a Raspberry Pi; MySQL to maintain and manage the audio database; the Apache Web Server, ID3Lib, a couple CD rippers and the X11 Window System, among its many components. Gleason's handcrafted code includes the GlassSuite collection of audio tools for Icecast and HTTP Live Streaming (HLS), and what he calls "a slew of code" to perform audio format conversions whenever new audio is imported into the station's audio library. Early in the development of Rivendell, SOX handled the format conversion, but Gleason noticed a slowdown due to "limited process control with the multi-stage command pipeline. This was before SOX had its library interface." His code performs the format conversions natively, without any shell outs. Today, there are three major broadcast operations based in Washington, DC, that employ Rivendell—Radio America Network, Salem Communications DC and Radio Free Asia—with listeners everywhere in both Eastern and Western hemispheres. This is not to say that Rivendell is available only to major players. Many smaller users have come to depend on Rivendell as well. 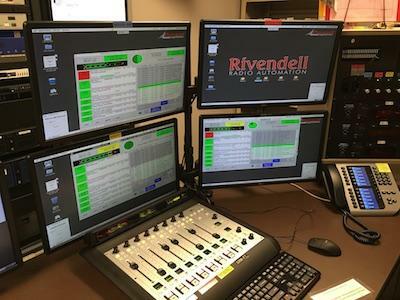 High school educational radio station WKHS-FM in Worton, Maryland, has been a Rivendell user since 2012, opting for a 32-bit Ubuntu-based appliance distro called RRABUNTU. A recent count showed more than 40 US AM and FM radio stations with a Rivendell installation in operation. A dozen miles south of DC, "Rolling Valley Radio", a low-power license-free community station uses the 64-bit CentOS version to broadcast its short-range signal to a small enclave of four or five suburban blocks. The Radio America Network in Arlington, Virginia, is a creator, distributor and syndicator of national radio programming, including conservative talkers Dana Loesch and Chad Benson. A stroll through the bullpen reveals a somewhat non-conservative and very creative attitude: a disco mirror ball hangs from the ceiling of a video production suite. Ukuleles are available for strumming while audio mixdowns are rendering. Coffee urns are labeled "Folger's" and "Creosote", and every Friday is Hawaiian Shirt Day. But on the air, it's all business. The network runs 24/7, delivering programming via satellite to affiliates from Guam to the tip of Maine. With hundreds of thousands of listeners across the US, dependability and stability are critical and downtime is not an option. So with the exception of a dozen or so Windows office machines and a quartet of Mac video editors, the plant is populated by CentOS desktops, in-house-built servers and Rivendell automation computers in five studios. The network also streams its programming over the internet using Glasscoder and logs every minute of broadcast audio around the clock on a Linux computer nicknamed "Delorean". Not being locked in to a single commercial system allows for a lot of flexibility. For instance, in studios that use more than one computer, actual physical desktop space is at a premium. Synergy software is used across all machines: one keyboard and one mouse move seamlessly across the screens and leapfrog from one computer to the next. And for assistant engineers and technicians lacking mad command-line skills but who need to tend to the system, Webmin is in use on several computers. Some staffers experiment on their own. Show producers in the bullpen employ Linux desktop computers running Audacity audio software to collect and clean up sound bites for various talk hosts. The same hosts surf the web and manage their call-screening software during their shows on CentOS machines. The network's production director favors UbuntuStudio on an older laptop, using Ardour to do preliminary mixes on several prerecorded weekend lifestyle shows (Figure 1). And engineers recently have begun exploring LinPhone as a replacement for Skype and ISDN as a two-way studio link with hosts at remote locations. Figure 1. 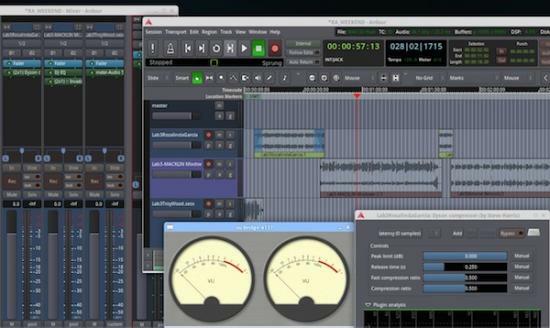 A screenshot of the Ardour audio workstation performing a mix on a ten-year-old Toshiba laptop. Radio America adopted Rivendell sometime around 2005 and has served as a proving ground for subsequent upgrades and improvements. It is a classic example of Linux radio automation working, and it's working well. Operations Director Rich McFadden, a former user of numerous radio automation systems, said "Rivendell—and Linux—gives us the most stable environment to stay on the air without interruption." Across the Potomac River from the nation's capital in Rosslyn, Virginia, the Washington DC cluster of Salem Communications—WAVA-FM, WAVA(AM) and WWRC(AM)—also is driven by Linux and Rivendell. The Salem cluster recently closed up its old facility (on the air since 1996) and moved to all-new studios and offices, with Rivendell tied in closely to its new complement of Axia digital audio consoles and engines. The software commands the consoles to perform specific functions and automatically reroute audio to different destinations, and because of its open-source nature, can be changed and rewritten at almost anytime. Director of programming Chris Roth noted that "It interfaces very well with our Axia/Livewire [digital broadcast consoles], which makes our operation run very smoothly." The master control console shown in Figure 2 handles three stations and the Sirius XM channel programmed by Salem. On-air execution is not the only opportunity for Linux—and open-source software in general—to shine in radio broadcast operations. Both the LibreOffice and Apache OpenOffice suites have replaced or augmented Microsoft Office when cost containment becomes an issue. Creative DJs who spin and mix multiple songs into sonic tapestries are exploring MIXXX, a free music performance tool that rivals commercial DJ applications. An Icecast-compatible encoder with the memorable name B.U.T.T. (Broadcast Using This Tool) has found many a home, including the college webcasting station E-Radio WMCR based at Montgomery College in Maryland. With most US radio stations owned by large corporations—several hundred each at a time—it is likely the dependence on Windows-type computer systems for radio broadcast will persist, given the need for large and fast equipment deployments, compatibility with other systems and familiarity of operation. Fortunately, the Linux alternative exists, and although it may not enjoy the exposure and popularity that Win-based broadcast products do, it is out there and being embraced by those who are looking for stability, versatility and affordability. DC today. Tomorrow, who knows?